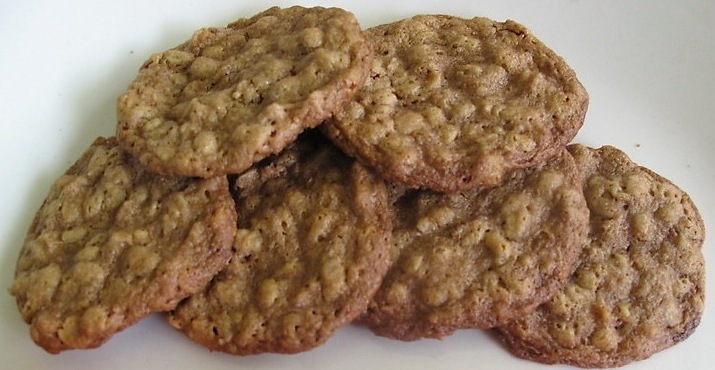 These Peanut Butter Oatmeal Cookies are thin little chewy treats. To get these right, keep a close eye on them as they bake, as there is a fine line where they cross over from chewy to crispy and either way they taste good, but chewy is just better. The peanut butter in them will still be really soft when you remove them from the oven and make you think they are not done, but they will set as they cool. I found 12 mins to be just enough in my oven. 1. Preheat oven to 375°. Cream butter and sugar. Beat in the egg. Stir in vanilla extract and peanut butter. 2. Mix together dry ingredients and stir into wet ingredients. 3. Shape into small balls and place onto an ungreased cookie sheet, they will expand quite a bit so leave room. Bake for 12-15 mins. This entry was posted in Baking, Cookies, Dessert and tagged baking, cookies, food, oatmeal, peanut butter, Recipes by Karina. Bookmark the permalink. Oatmeal based cookies are just the best. These look really really delicious.